Earn up to 23,592 reward points. 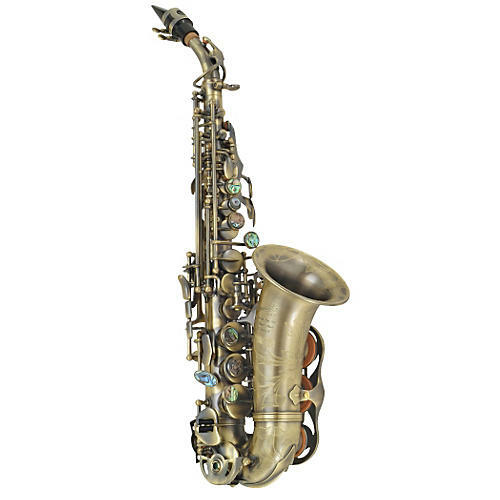 Rich sounding, free-blowing, professional-quality curved soprano saxophone. The P. Mauriat PMSS-2400 DK is a beautiful, charming instrument, and makes an excellent specialty or double for any serious reed player. Curved soprano is by its nature a very sweet ax with its melifluous timbre and its reminiscece of a high female voice. Relative to its more common cousin the straight soprano, the curved soprano allows the player to enjoy a greater immediacy due to its ability to provide a more direct monitor off the bell, and offers a wholly different experience than the traditional "unemployment stick." Fine keywork and expert craftsmanship characterize the PMSS-2400. These saxophones have quickly become popular across America and across the world by virtue of their attractive price and excellent quality. Its range covers low Bb to high F# and features a dark, brushed antique lacquer and a detachable curved neck. The PMSS-2400's Intonation is excellent, as is its projection and overall tone. Order a P. Mauriat and get a soprano that's ahead of the curve.